By modern-day black standards, this is a very strong card. First strike and pro-white are very nice to have, and at two mana, this is well worth playing. My only fear is that there may not be a deck for it, given that most black creatures just aren't up to par with this, and this calls out for monoblack aggro. We'll see if I'm wrong. The path of evil may lead to oblivion, but it does got style. Another card that's often been imitated, both because of its power level and because of its outstanding flavor. If you can boost some at the pre-release tomorrow, play with them early and often. Black Knight is sure to be as much of a hit in 2009's Magic as it was in 1993's. Constructed: With all of the new cool stuff for white, black still has some powerhouses. The new art on this one looks good. Casual & Multiplayer: Bring in the Knights. Back in black. Limited: Very good card against white and others but red can just burn him out. Still a top pick in my book plus he is a uncommon. Michael "Maikeruu" Pierno Today's card of the day is the return of the classic Black Knight. Last seen in Fifth Edition from March of 1997 the Black Knight is one of the strongest two drops in Black's history. First Strike and protection from White combined with Black being immune to several of their own spells makes it difficult for many decks to handle. Constructed keeps this card at an even level as the Human and Knight types aren't heavily supported currently. White Weenie decks have almost always been popular and Black Knight is enough of a concern to cause some sidedecking when seen. Unfortunately the protection doesn't extend to non-targeted effects like Martial Coup or the soon to be rotating out standard Wrath of God, but many popular removal options are targeted White spells. A good choice at the two drop slot or in the sidedeck. Casual has the card much the same as constructed, but there is some Knight support with Haakon, Stromgald Scourge and Auriok Steelshaper. Limited is a harder environment to justify a double Black mana cost, especially at a two drop. While it is a threat on the field, having to play two or three colors most of the time can keep the Knight trapped in your hand as you draw the wrong type of land. Your opponents will also be likely to play multiple colors which reduces the odds of Black Knight avoiding an entire deck's worth of threats. Even with that any deck playing enough Swamps will be glad to have him and he should be a relatively high pick. I do not suggest drafting him first as it locks you into a single color too early. If he comes around after passed you can safely guess that nobody else at the table is playing Black as their primary color and can draft into it a bit more heavily. In sealed it depends more on your other picks, but again with enough Swamps this is an easy addition. Multiplayer is a great place for the Black Knight as it is small enough to avoid causing too many waves, but is almost definitely going to cause some white players a headache. Again the double Black mana cost limits the deck choices, but as an early game drop it will keep you well defended. First Strike will keep most creatures looking for other targets while you can build up towards your higher cost spells. Welcome back readers today’s card of the day is the iconic opposite of White Knight, the aptly named Black Knight. Traditional fantasy elements and iconic creature types and spells are at the core of Magic 2010 the contrasting knights are a perfect example of what Wizards is hoping to highlight in core sets. 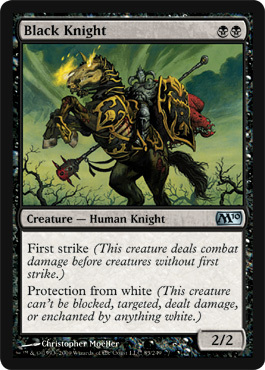 Surprisingly this is the first time Black Knight has been reviewed by the Pojo staff; a lot has changed since the introduction of Black knight creature levels have shifted considerably, a 2/2 first strike with protection from white is still an impressive creature for only two mana. In current standard protection from white makes it immune to Oblivion Ring as well as Path To Exile and the most commonly played white creatures in the top tier decks. Mono black decks are set to make a triumphant return with the introduction of Magic 2010; a first striker with immunity to a lot of the commonly played played spells could be a auto include in future black decks. In extended and eternal formats I doubt Black Knight will make the cut possibly in variants of monblack decks. In casual and multiplayer two mana for a 2/2 first strike is a good deal the protection is just gravy, if your area is heavy in white Black Knight would be an all star addition to dedicated black decks. In limited it’s a cheap creature with great abilities a high pick if you’re heavy in black. One of the older cards being reprinted in M10 Black Knight may once again get its time to shine.